Who knows why we love our Airstreams so much? These American made beauties, whether vintage, new or somewhere in between become something very special to those of us who have the privilege of owning one. So, whether you travel short distances or long - use it as a full time home, home away from home, or business - whether you prefer mountains, beaches, lakes, festivals, rallies, or sometimes just your own driveway, this site is for you. Welcome to "For the Love of Airstreams" where we will be inspired by one another. 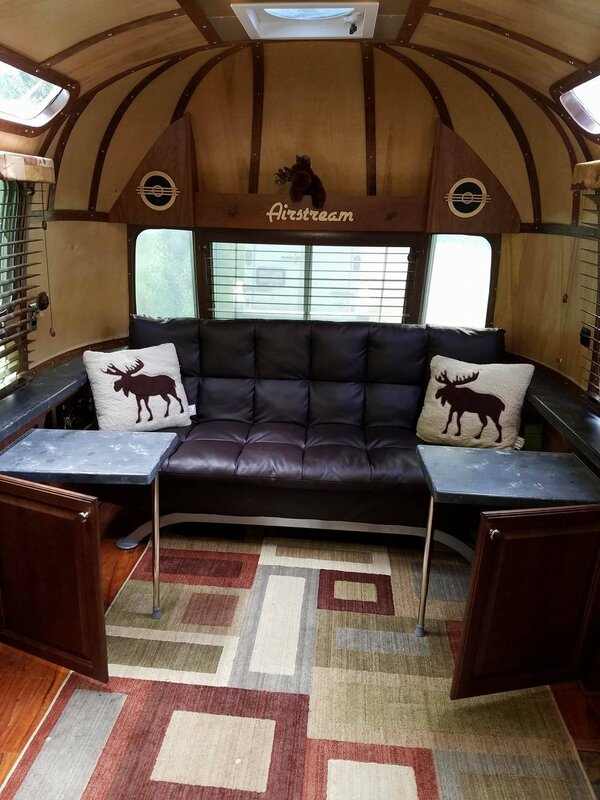 Jim and his wife Marlene purchased their 1975 31’ Airstream Land Yacht Sovereign in 2015 when they happened upon what has become somewhat famously known in the Airstream community as The Silver Moose. I wanted to know how it was they came to restore this vintage beauty; so Jim was kind enough to let me interview him and share their story. Jim and Marlene have two sons; when their boys were young, they spent time camping and enjoying the outdoors in a pop-up camper. But, when the opportunity arose to sell the pop-up and, for the same price, purchase a timeshare and travel with their boys, they took advantage of it. Well, the boys are now grown and Jim and Marlene fell in love with camping all over again when Jim built a teardrop camper. But, the small size wasn’t ideal for the long term so they began their search for a larger trailer with more of the amenities of home. The two could not justify spending $45,000 for a trailer they would use a handful of times per year. At that point, they weren’t necessarily on the lookout for an Airstream. But, an Airstream found them. They saw a somewhat neglected Airstream for $4500 at a nearby dealership. Someone had gutted the trailer and had taken it to the dealership to replace the electric jack, water heater and exterior lights. But, the owners abandoned it, never coming to pick it up. That worked in Jim’s favor - he offered the dealership $2000 and they accepted. It was a big project - it smelled absolutely horrible, had mice damage, and the only thing left in the trailer was a rotted kitchen. Jim is a home builder so he had both the knowledge and tools to take on this kind of project. 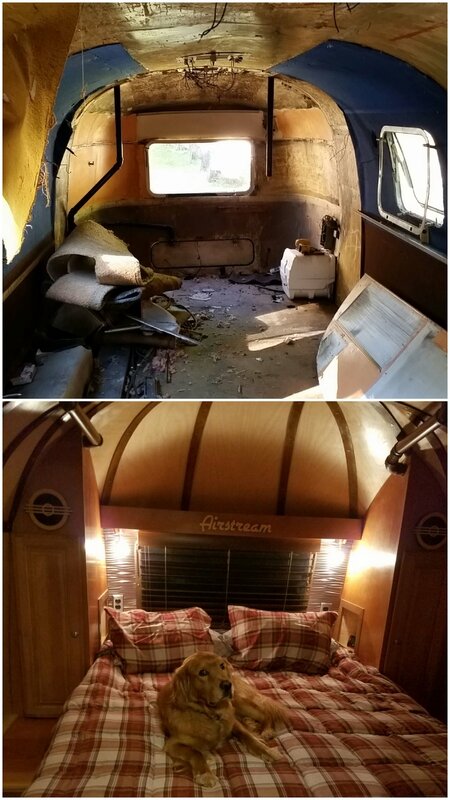 They wanted a different layout than the original design, so they moved the bedroom to the rear, traded the twin beds for a queen and put the bathroom in the middle of the trailer. 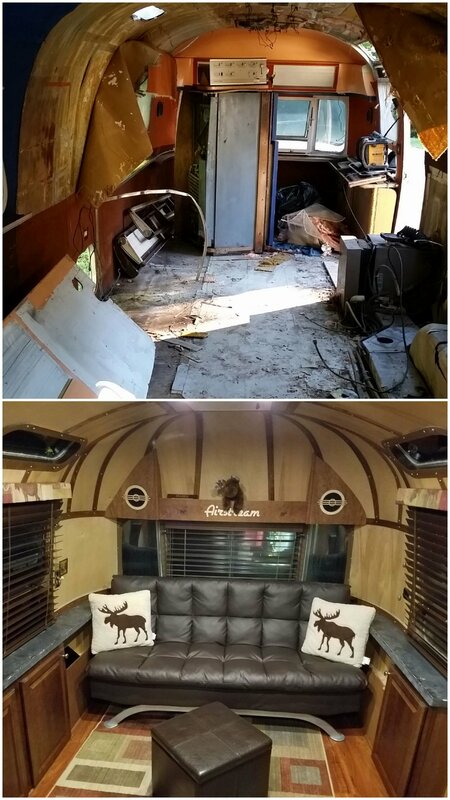 After they finished gutting the trailer, they repaired the frame, installed a new subfloor as well as all new plumbing and electrical. With that finished, they had a blank slate. Their goal was to create the feel of a Northern Maine cabin. The interior birch skins are absolutely gorgeous and make this such a unique project. Jim used 1/4 inch birch throughout; bending the boards was initially a challenge. He broke a few and at $65 a sheet, that is definitely a bummer. He learned that if he got them a little damp, it went much easier. All of the maple cabinetry in the kitchen and living room is a combination of store bought and custom. Jim built the boxes and face frames for the cabinets since in an Airstream you are working around things like curved walls and wheel wells. And, he installed cabinet doors that they had purchased. The warm wood tones make everything feel so inviting and I love the shallow cabinets he built in the living area that house small tables - such a great use of space. The countertops are all Corian, which Jim built as well. For the cabinetry in the bedroom and bathroom, Jim repurposed doors he had leftover from other projects and built the cabinetry around them. He purchased a new shower pan at Home Depot and built a custom shower using Formica kitchen countertops that looked like granite and fit their decor. 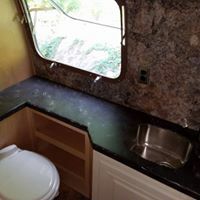 The floors throughout the main part of the trailer are snap together laminate with a foam rubber backing; and the floors in the entry and bathroom are a heavy linoleum (1/8 inch thick) that came in 18x36 inch tiles. They liked how the linoleum picked up the color of the laminate floor. They purchased all of the flooring at a discount flooring company for a total of $180. The fireplace fits perfectly with their cabin feel. They thought about refurbishing the furnace, but even if they did, the furnace would still be forty years old. So, they opted for an electric fireplace. They aren’t boondockers, so an electric heat source was perfectly fine for them. They can also turn off the heat and just use the flame for ambiance. Nice!!!! Jim and Marlene’s son can be credited for the beautiful logo work. At college he had access to a laser cutter. 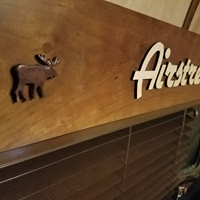 Take a look at the Airstream and Silver Moose logos and speaker grills he created. He even made them custom coasters and salt/pepper carrier. The screen door protector was created locally at a friends shop. The couch is a futon they ordered on-line. 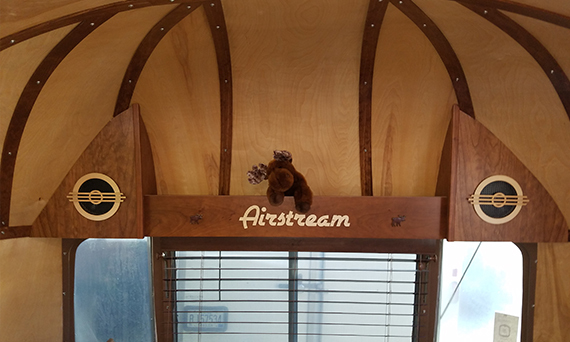 The aluminum arched legs make it perfect to recreate the arch of the Airstream! Jim credits his wife for the pillows, clock, shower curtain and all the great moose decor. They even found moose shower curtain hooks; because they didn’t need all of them for such a small shower, he used them to customize a shelf in the living area. So, how did the Silver Moose get it’s name? Playing around with names that just didn’t fit, one day Jim picked up a small silver moose keychain from a client. It hit him. He talked with his wife and they both knew that would be the name of their home away from home. It is amazing that in his spare time he completed all of this in about 6 months. As a result of this project, the two realized that there was a need to save and repair vintage campers and thus, Silver Moose Restorations was born. Jim will repair, rebuild or remodel any vintage camper. You can find Silver Moose Restorations on Facebook https://www.facebook.com/silvermooserestorations/or visit www.silvermoose.me. Reach out to Jim directly at jroy187@aol.com. TO POST A COMMENT: ENTER YOUR COMMENT; CLICK POST COMMENT AND THEN ENTER YOUR NAME AND LOGIN AS A GUEST. This site showcases inspiring Airstream renovations, decor and maintenance. It provides comprehensive lists of items to stock your trailer. See amazing before and after's and learn how to get featured. Peek inside now! Share Your Airstream Story With Us! Visit the "Get Featured" Page to learn how. The posts on this website are intended to be a description of the projects we and fellow Airstream owners have completed; they are in no way intended to be considered expert advice. Reference to products utilized are not endorsements; appropriate research should be completed before any project or purchase.